Christ expects His people to worship Him in spirit and in truth [John 4:24], corporately in the fellowship of God's people. Worship is man's highest calling. It is to be both generic and specific. That is, worship is to be engaged in every day life, as well as in specific, formal exercise on the Lord's Day. The various elements of Christian worship are to be engaged with the whole heart, soul, mind, and strength [Mark 12:30], not while asleep, in a trance, or fidgeting while wondering about lunch. The manner of worship is legislated by God in Scripture; we must approach the Covenant God on His terms [e.g., Lev. 10:1-2]. Hymns, prayers, offerings, exhortations, confessions, Scripture readings, sermons, and other aspects of worship are not to be performed by mere rote reflex. They are to be engaged with devotion, as unto the Lord. In other words, we must remember that Christ is with us "all the days" [Matt. 28:20, GK.] - including while we worship. We are to rejoice in the baptism of new converts, as an aspect of worship and as we witness the discipling of the nations [Matt. 28:19]. The Christian should seek a church that promotes sound doctrine and the development of a Christian worldview based on biblical teaching. 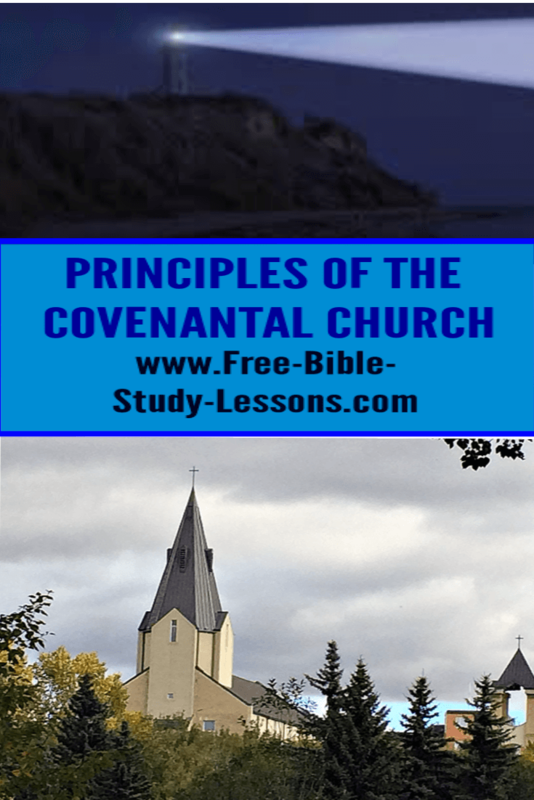 The church should be a covenant-community fellowship, committed to the historic creeds of the Christian faith [the Apostles' Creed, Nicene Creed, etc.]. It should not be associated with the National or World Council of Churches. It should have a solid educational program. The piecemeal Christian faith so widespread today does not measure up to the calling of discipling toward a Christian culture [Matt. 28:19]. The church should actively train people to submit to Christ's authority [Matt. 28:18] and work [Matt. 28:19-20]. As a leading officer in the Church, Paul was concerned to promote "the whole counsel of God" [Acts. 20:27]. Several programs could be used to promote education in the truth. These include: catechetical training, a church library, a small group book-of-the-month fellowship and discussion program, a local theological seminary program for members and the community, and either the setting up of or the supporting of an already established Christian day school. The church is to be composed of a system of courts designed to locate responsibility and resolve problems, as Christ's people have His authority ministered to them. The influences of the democratic spirit and of voluntarism are alive and well in American Christianity. And this is unfortunate. The Church of the Lord Jesus Christ is viewed by many as so many islands in the stream of history, unconnected and unconnectable. Bold claims to independency are proudly displayed on thousands of church signs across the land. Yet the Scripture has ordained a covenantal government of elected hierarchical rule in the church - a rule patterned on the Old Testament revelation [Ex. 18:19-23, Deut. 1:13-15]. In the Old Testament, elders possessed jurisdictional authority [Ex. 12:21 cp. v. 3] and were organized into graduated levels of courts [Deut. 1:15]. The New Testament office of rulership in the Church even adopts the same name as the Old Testament office: elder [1 Tim. 3:1]. 1. Though Christ ultimately "builds" His Church, He gave its keys to men to exercise "binding" authority [Matt. 16:18-19]. 2. There is a gift of government given to some, not all Christians [Rom. 12:6-8, 1 Cor. 12:28]. 3. Titles expressive of authoritative power are given to some, not all Christians [1 Tim. 3:1-2, 6, 5:19]. 4. Office is granted by divine appointment and entered by solemn rite; it is not automatic with conversion [1 Tim. 4:14, 5:22]. 5. The functions of office are expressive of real authority [Acts 20:28]. This hierarchical authority is graduated into lower and higher courts having authority over individual and multiple congregations. The classic illustration of this is found n Acts 15. There we discover the Church functioning hierarchically to resolve a doctrinal dispute in a particular church at Antioch [Acts 15:1-2]. The matter was sent by representatives to a trial before a joint council in Jerusalem [Acts 15:2]. The matter was debated before the entire council [Acts 15:4-19]. The conclusion of the non-local court action was sent back down to the court of original jurisdiction [Acts 15:20-23]. It was considered binding upon the Antiochian church [Acts 15:28] and was sent to other churches for their instruction [Acts 16:4]. Discipline in regard to the nature and structure of church government is important for the vitality of the Christian faith in itself. What is more, the divinely ordained government of the Church is to be model for the civil government, as well [Deut. 4:5-8]. In that the church is commanded to go into the world [Matt. 28:19a], it should do so in the name of the Triune God [Matt. 28:19b]. There are a number of opportunities of local evangelistic outreach for the church: friendship evangelism, Bible conferences/seminars, radio and/or television ministry, tape ministry, campus outreach, newsletter ministry, and more. Contrary to much church growth advocacy, however, these should be employed to diffuse light [Matt. 5:14], not to entertain the carnal masses. In friendship evangelism, for instance, the church is to engage its members in evangelistic outreach through one of the most natural and successful means of evangelism: friendship associations through personal acquaintances and family members. Statistically it is reported that the average Christian knows 8.4 unchurched individuals. These are prime targets for friendly overtures by Christians. Furthermore, most Christians today can trace their initial point of contact with Christ through friends and families. The friendship evangelism methodology is really quite simple. In special training sessions, the church should have each member jot down the names of unchurched acquaintances. These names should be made the matter of specific, long term prayer. A few of these names should be especially set apart by each individual for the purpose of building bridges, i.e. nurturing friendship ties by various means. The ultimate goal of these strengthened ties should be eventually to confront them with the gospel claims either directly or by merely inviting to take them to church with you. Although the Church is not of the world, it is in it and must make her presence felt as "salt" in the earth [Matt. 5:13]. This will involve organizing a truly functional diaconal ministry of social concern and outreach in the name of Christ. Again, this promotes a biblical model for social concern and Christian culture building [Matt. 28:19]. Also the Church should pray about and study social and political issues and encourage social/political involvement through letter writing campaigns and other means. Of course, there is a need to be careful not to endorse candidates and become too "political." In America's colonial history, the Church played an important role as a source of direction and information regarding social and civil affairs. Unfortunately, the Church today is too often a study in irrelevance. Yet Christ calls His Church to be "the light of the world" and "the salt of the earth" [Matt. 5:1-14]. Hence, Paul's appointment to take the gospel to nations and kings [Acts 9:15]. Excerpt from The Greatness Of The Great Commission by Kenneth L. Gentry, Jr.